Walking into “Sea Smoke” at the Portland Public Library was like walking into cooling cloud. Because the exhibit’s first visible works were cartoonish, large-scale woodblock prints by Christopher Patch, the sense of calm that greeted me might seem surprising. But there is something to be said for legibility – especially when a work of art makes its welcome clear and then opens the door to artistic depth and mystery. HOURS: 10 a.m. to 7 p.m. Monday to Thursday, Friday until 6 p.m., Saturday until 5 p.m.
One of the two 4-by-6-foot blocky black prints with wood-grained borders portrays what looks like the “W.R. Grace” – an oncoming ship in full sail whose portrait this column discussed in a recent review of the Maine Maritime Museum. The other image features a black silhouette of “The Sea Hag” – Popeye’s cartoon nemesis. However unlikely it may sound, this pair effectively sets the stage for “Sea Smoke.” They tell of stories of the sea and of a relationship to narrative and text. A couple of quotes on the wall secure the idea that the images play off of texts. 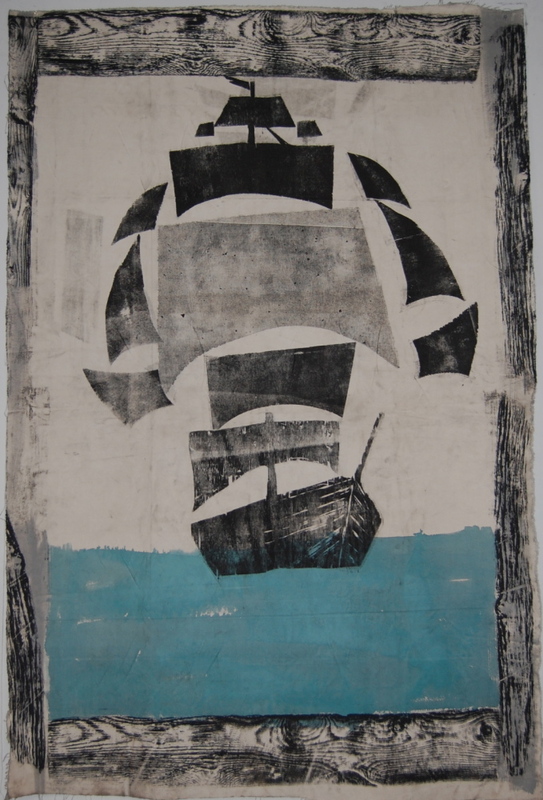 Patch’s “The Black Barnacle” was an early 19th-century pirate ship that may have been the inspiration for the “Pirates of the Caribbean” Black Pearl. Between this and Popeye, what we get isn’t complete narrative but the idea of tales of the sea: wisps. 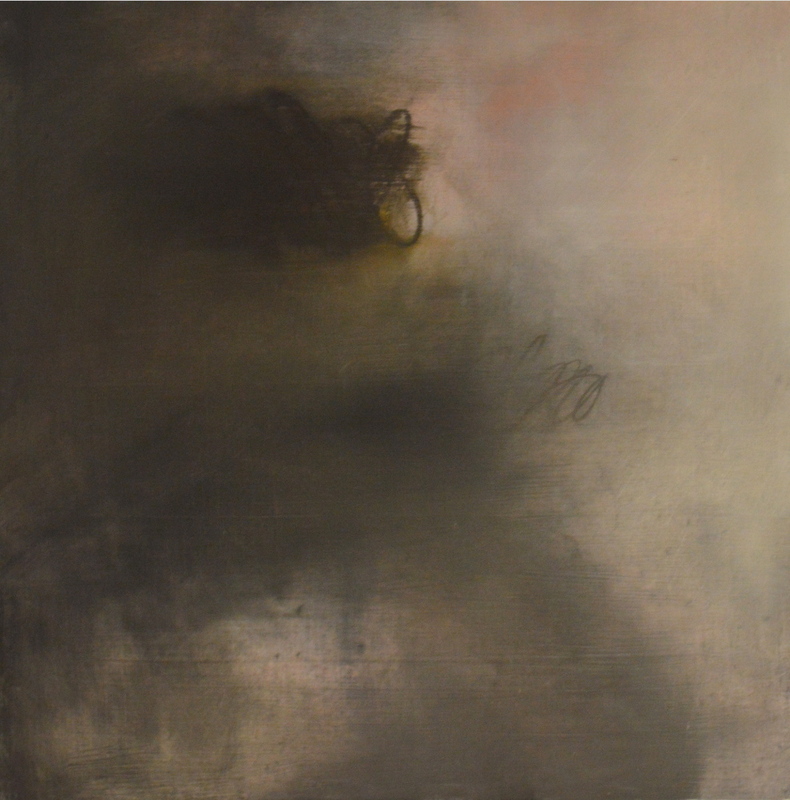 After Patch, “Sea Smoke” abruptly dedicates itself to elegant abstraction. It is this stretch of work that is the most deliciously and indulgently deserving. It’s foggy like the moment of waking from a nap on the beach, when your eyes haven’t quite yet found their way back to the exquisite cerulean skies of summer. One after the other, the next artists won me over. First, Honour Mack’s lusciously punctuated abstraction, “Ingotine,” then Colin Sullivan-Stevens’ simple drawings of complex octahedrons, featuring a perfect square produced by the otherwise irregular sides of the drawing of the solid – an old schtick, but a good one. 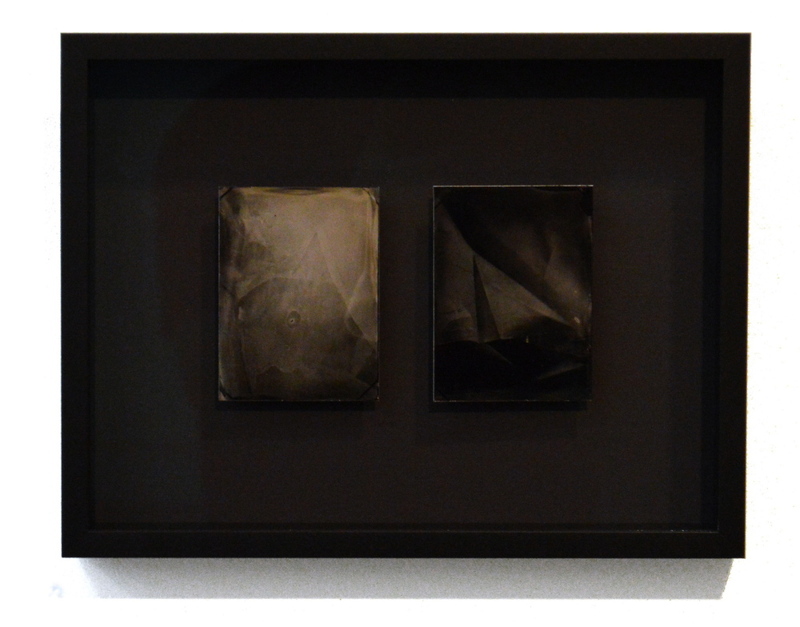 My favorite work in the show is Sage Lewis’s trio of elegantly black-framed tintype diptychs – small, matched pairs of vertically rectangular black and white tintype photos of paper folded into geometrically complex shapes. These largely black photos are floated under glass and over the black background of the black frames. Tiny but dense, these gem-like pieces comprise the best I have seen to date of Lewis’s generally excellent work. Lynda Litchfield’s encaustics mix a lightness of touch with a weather-worn aesthetic that reinforces the sophistication of these seemingly simple aqua and white objects. A bit of pencil drawing on them infuses just enough to transport them from the object indulgence of hot wax painting to the headier world of drawing. “Float,” in particular, succeeds. It reminds me of an Alex Katz in which a lake float is barely visible in the summer morning mist. But Litchfield creates an edgy conversation between two very different mediums. Alison Hildreth’s three map-oriented drawings flow open like secret treasure maps. Wizened and well-traveled, these tall, vertical drawings cover themselves in the aging of the world – geology under roads, cities, fortresses and the documentation of threads of human presence as they fade in and out under the dust of previous societies. Katherine Hargrave’s two paintings are poetic, dense and beautifully executed, but they rely too much on over-hip obsession of outsider artist Henry Darger’s creepy Vivian Girl images, which made such a splash in the art world a few years ago. A deep visit would be one thing, but these feel like fad. The wall texts invite you to recall (or look up) that sea smoke occurs when a light breeze of cool air passes over warmer air just above water which then cools below dew point, thus producing the sometimes swirling steam we see over hot tubs or hot drinks. It’s a funny thing, however, since the other text, from a 2013 poem by August Kleinzahler, drifts even further from the reality of sea smoke (toward fog). But, still, the literary connection to the show works and is particularly satisfying in a library gallery. What doesn’t work in “Sea Smoke,” however, are the paintings by Rufus Tureen and curator Susan Tureen. Her overly-simple works just don’t rise to the high standard of surface and finish set by the other paintings she selected. And Rufus Tureen’s “The Deep” misfires with a kind of I-don’t-care-if-you-think-I-can-paint aesthetic that was hip in New York a few years ago. (In Maine, we always cared.) It looks like it was painted in an hour by someone in a bad mood. 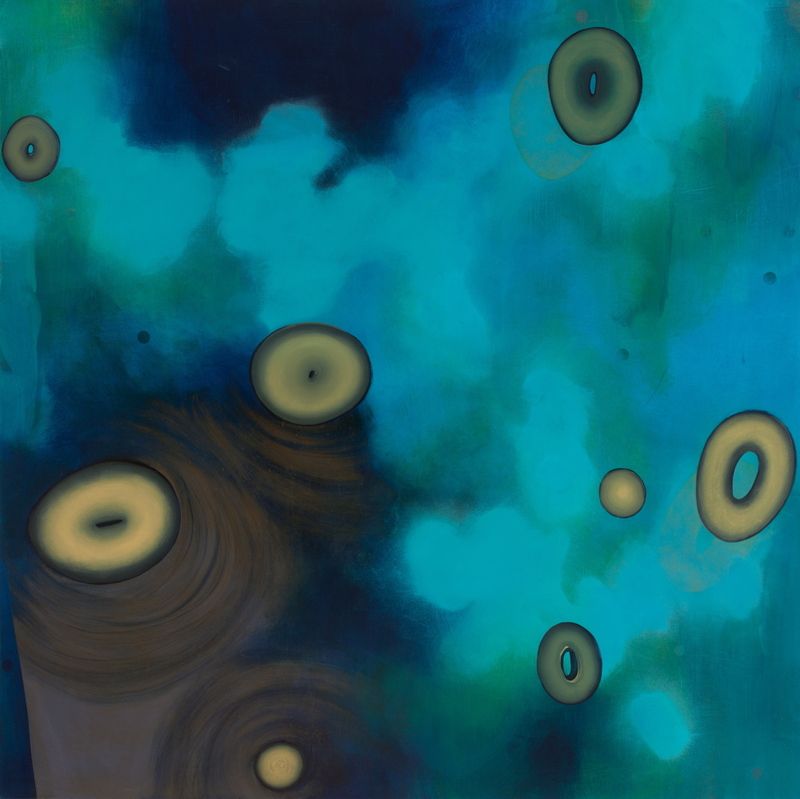 The fit for “The Deep” is supposed to be Katherine Bradford’s work with its brushy but unfussy surfaces. But Bradford’s work has real depth and so rises well above Tureen’s. Directly across the room from Patch’s “Black Barnacle,” Bradford’s “Vespa Painting” plays the part of punctuating bookend. We’re done and the story is over, it seems to tell us. And it’s a soaring note on which to finish: Bradford takes on the seminal paintings by Christopher Brown, a leading West Coast artist who recreated multiple frames of the film footage from the Kennedy assassination, with a loose style that makes it difficult to detect differences from frame to frame. 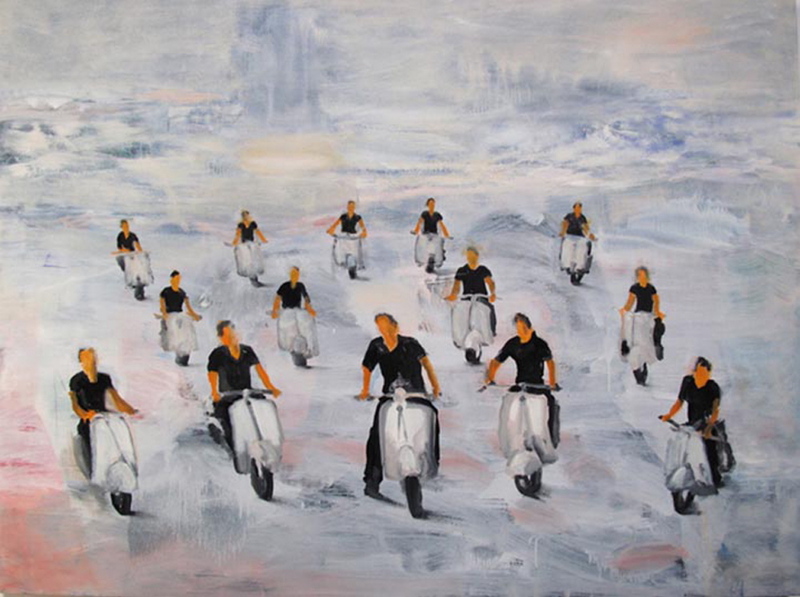 Here, Bradford creates a phalanx of Vespa drivers that appear to be imperfect clones. “Sea Smoke” isn’t successful for some well-played literary polemic but because it smartly and comfortably features some great painting led by strong abstraction. There is plenty of excellent abstraction in Maine, after all, but we just haven’t yet figured out what to do with it.